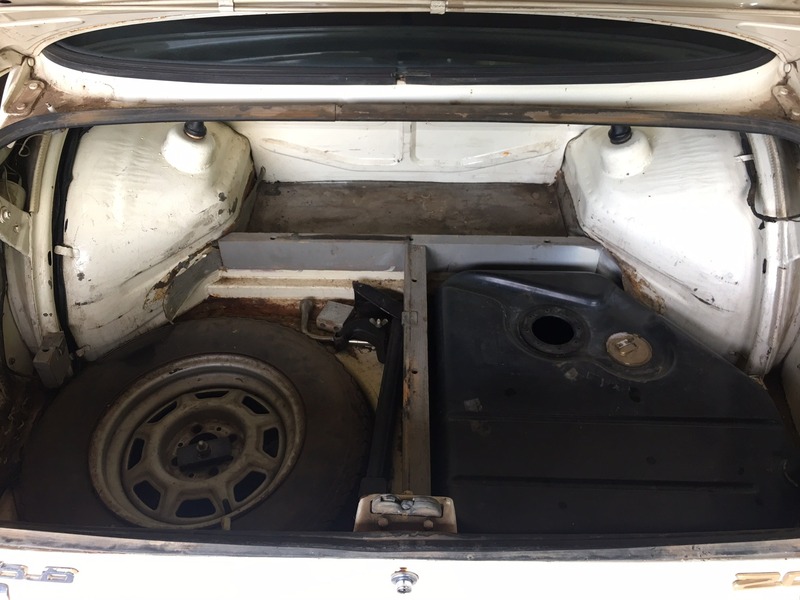 Could you please help me with some pictures or links to a Turbo trunk that is properly fitted with elephant skin? I recently purchased some of the elephant skin form Rogers tii. My car had the wrong stuff in it when it arrived but i want to make sure my upholstery guy does it properly. I mam also not sure what to put in the area in front of the oversize fuel tank. when you go towards the backseat, there is a drop off. 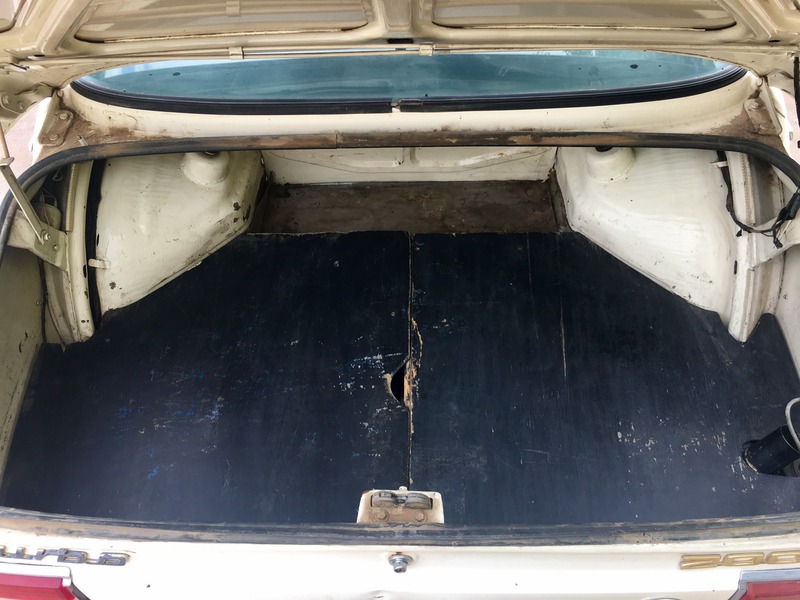 My trunk has a piece of wood going across there and I am not sure how it should be trimmed out. I am trying to get the car as close to stock as possible, I am taking it to a show in Tampa on November 11. There are some people that think the floor boards for the raised floor on the Turbo should not have elephant skin and should just be painted grey. I have seen them both ways. I decided that I did not like the painted wood and went ahead and installed the elephant skin. The panel ahead of the tank should be just the same as the standard 2002 and sits lower than the raised floor, this defiantly had the elephant skin. I had Esty make me a trunk mat with a separate piece for the space between the wheel wells. Actually I’ve heard that turbos only came with either painted floor boards and seen Turbos with original carpeting. Boy elephant skin. None the less that’s what I have. I am the second owner and my (7/74) trunk does not have elephant skin, only painted. It did come with a "foam" mat that is dappled grey and about 1/8" thick. It fits not only over the painted trunk panels, but goes down the back and fills the area between the wheel wells. The board that crosses the back is painted lightly in grey, like the rest of the panels. BTW my car does not have elephant skin on the lower wheel wells as 2002s and Tiis normally do. My mistake on the wheel well elephant skin. The paint is almost translucent. Mine has it in the lower well and over the lower bits of the wheelhousings as pictured above. A previous owner painted my wood panels black but there is no evidence of them having the vinyl on them. I have seen the mat described above. The car from BaT in May (later sold at Mecum in August) has that and it’s shown in the photos. My ‘75 530i had that in the trunk but I’m reasonably sure I’ll never find the material to make one. 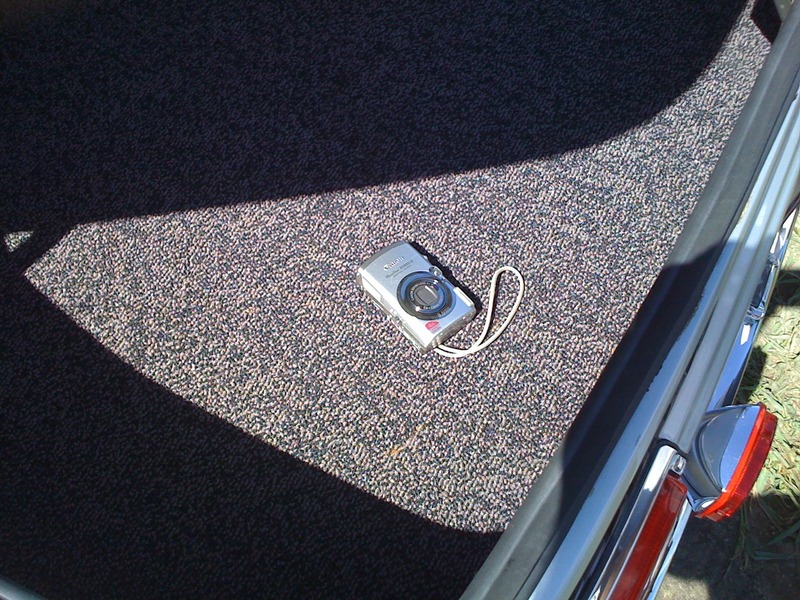 This is the rug I’ve seen that comes in the turbo trunk. I know some owners were able to purchase in Germany. Interesting. Seeing these pictures I just realized BMW didn't add the reinforcements to the quarter panels like the other square tail light cars. Or maybe since the turbo cars weren't meant for the USA, the body was kept like the other 74+ European specification cars. Can someone clear this up for me? It was a U.S. only feature for the 5 mph bumpers. Look at this old Roundel article about a federalized turbo with big bumpers and side markers (I've posted this here before). I actually have 2 74 Turbos, both early production. Neither one has elephant skin on the wood panels. I just assumed this was incorrect based on all the 02s I have owned in my life. Now I am starting to believe that they are not to have any covering. They both have what you can call a,trunk mat, which fits loosely over both the panels. Both cars were original Switzerland deliveries. I am going to compare them side by side for similarities instead of differences. You should post some photos! Just posting a few pics. I don't have any good ones yet. Thanks to all of you for the responses to my question. To clarify, in that “foreword section” of the trunk, do you believe your turbo originally had three pieces of elephant skin like wkohler’s turbo: left strip, rectangular floor piece, right strip? Glue trail? I cannot imagine them solely installing the left and right strips and not installing the rectangular floor piece. I have only the left and right pieces, with no evidence of glue for the bottom floor piece. Then again, my '72 2002 did not have that either, left, right and plywood panels. The car has been in the family since 1982 as the second owner so I think this is correct; at least for this car. I will try to photograph the foam trunk mat today.